Today a lot of car manufacturers make minimum improvements in a field of engines and technical characteristics of the vehicles because there are only a few ways to improve cars with diesel and gas engines significantly. 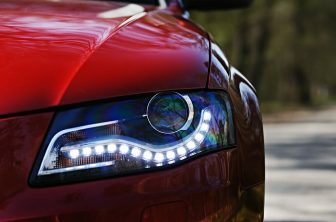 That`s why they do a great job to make cars more pretty looking and stylish, improve their interiors and make drivers feel comfortable and cozy. But in all possible ways car is only just a metal with plastic. Thus, there are many ways that can be damaged, and because of this, the appearance can become less attractive than it should be. And the most spread reason for it is dents. Have you ever had it? I suppose yes. And people used to spend a lot of money to get the car to the maintenance station and pay them for pulling dents. Basically, when the dent is big, they do everything right. 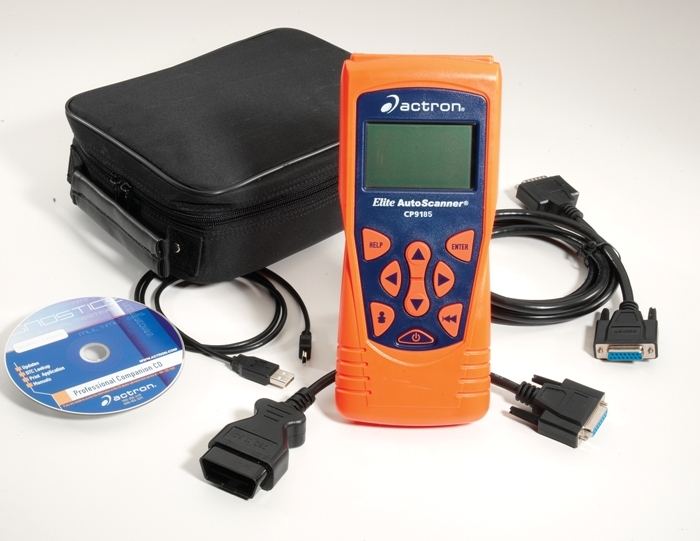 But if you have got a small one there is no will to go to the service station and pay money for 5-minute work. 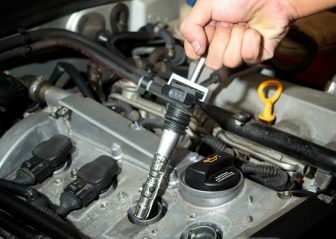 Actually that`s why we make this list to show you the best things that will help you to pull the dents out all by yourself and make your car good-looking again. Have you seen Mission Impossible: Ghost Protocol? Then you definitely remember the scene with Tom Cruise climbing on a high scraper surface using incredible devices. Unfortunately, we cannot offer those to you for, but this puller has the same principle of work as those devices. All you need is to place a puller on a dent and lift up the lever. 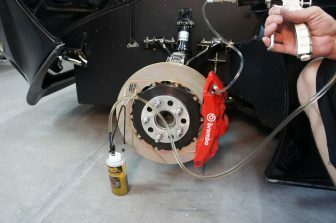 It will create a vacuum between the puller and the dent, and after that you can easily pull it up and eliminate it. It is small-sized device so you will not have big problems with its carrying. At the same time, despite its small size, it has really big pulling power. Soft rubber cup forms seal on most flat, non-porous surfaces and don`t make any scratches on a surface. And in case you’ve already bought it, used it once to pull up the car dents and felt that it’s useless now – you’re wrong! This puller also works on sheet metal, body panels, glass and other surfaces. 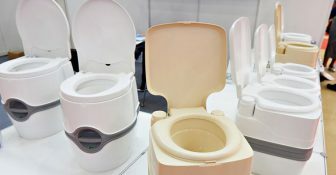 That TEKTON creation is similar to the previous one except for the one detail – it is twice bigger than already mentioned one. 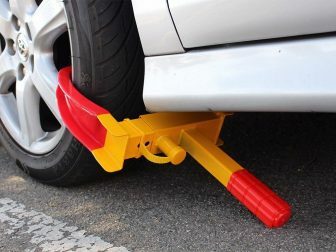 That`s why, if you are a law abiding driver and dents on your car are possible only because of the accidental failure of parking in the garage, you should buy exactly this one. It will help you to remove all possible variants of small car dents in 3 moves. 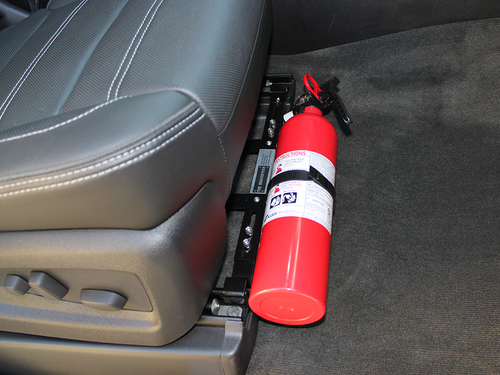 It has rugged and high-impact nylon construction that will make you sure you will not do any harm to your car. 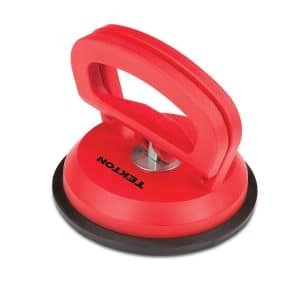 4-Inch diameter heavy duty rubber suction cup can pull out all the dents that were made because of the wall, fire columns, and border strikes. Also, it grips smooth sheet materials like plate glass, paneling, and sheet metal for easy lifting and carrying. 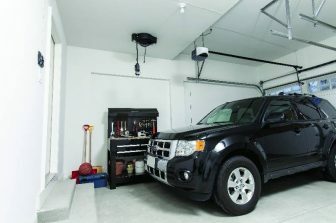 That’s why this device will not be lying in your garage for many years waiting for its time – you can use it in everyday life to fix small problems. A lot of old-school guys may say: “Plastic is trash, you cannot fix anything by using it.” Well, especially for those people Yoohe made a metal dent puller with the same characteristics. 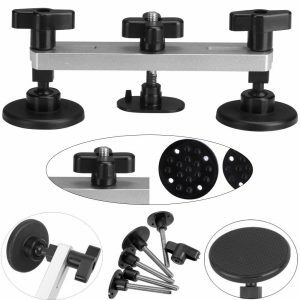 That`s why if you despise plastic devices and want to have a really, as you said, strong and reliable puller you may consider buying this product. 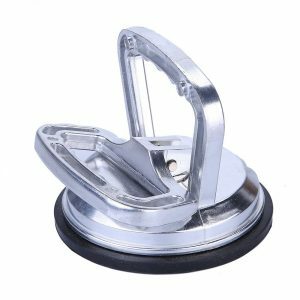 It has a perfect metal-colored design, and durable aluminum handles are perfectly compounded with your hand, so there is no discomfort during pulling dents. It is made of aluminum without any chemicals or other toxic material that may be used in this process. 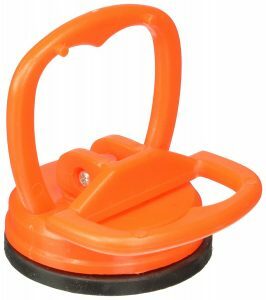 Also, this dent puller is an ideal tool for moving flat objects in any home garage, so it is not a “one-time using” thing. This product has a very affordable price so don`t miss a chance. 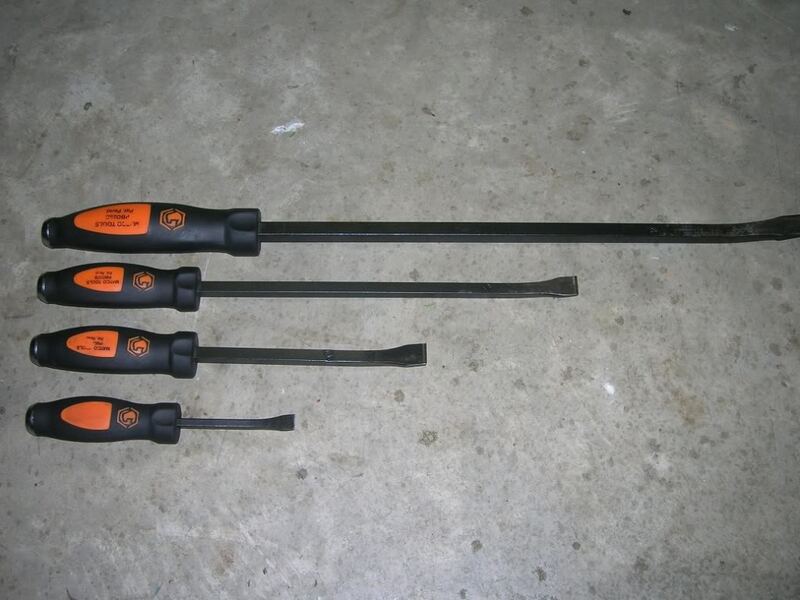 And now is time to tell you about a really awesome device like Bridge Dent Puller. Many of you may not immediately understand how this works. But it`s really simple, and now you will see it. So here we have 3 pops – one in the center and two by sides. You should put all of them on the car or another metal surface using glue sticks and hot melt glue gun. The middle pop or side pops must be pulled on a dent. And after that, all you need is to screw the side or central pops (depends on what you need – to fix the side dents or the central one). This process is completely easy and ingenious. It also has 7 different shapes tabs for all different dents. Many questions may concern glue sticks and a glue gun. Well, the hot melt gun and hot melt mini glue sticks heat up very quickly, normally it needs 3-5 minutes, and after pulling dents you can take it off simply by disconnecting along with the pop. Modified bridge dent puller. This one has the identic ratio as -1/2″ Vacuum Handle Dent Puller and TEKTON 4-Inch Dent Puller that have been already mentioned previously. Yoohe bridge dent puller has massive bulkheads between pops so you can use it to fix more complicated dents. It has 5 pcs glue tabs that can be used not only for car dent removal but also in hail damage and car paint and varnish repair. Complete with a dent puller you get a flat stick to remove the hot glue after the repair. This repair completely preserves the original car paint. 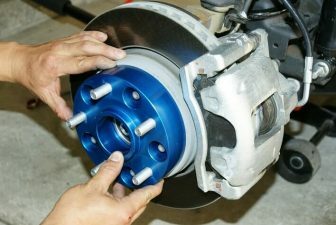 At least, it can save you a lot of time because you don`t have to wait for the car dent repair in the repair shop – you can do it yourself in half an hour. And also it`s much cheaper than repair at the service station. That`s why there are no reasons for you to reject that offer. 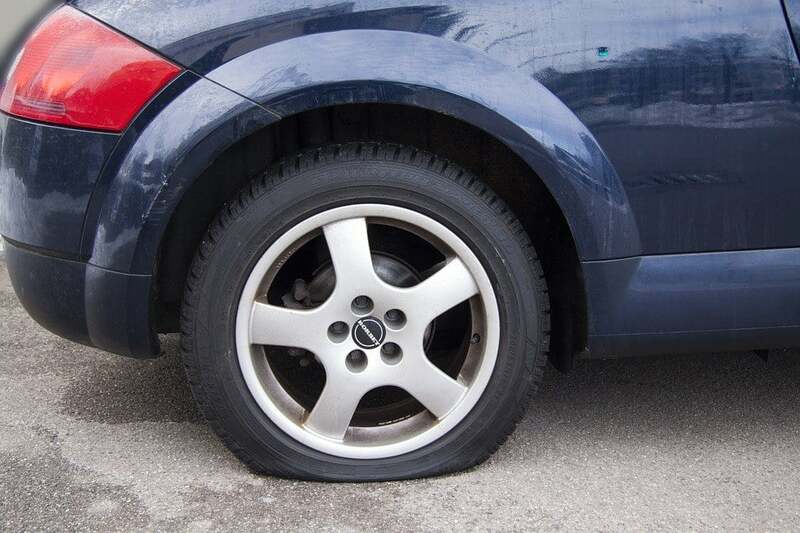 Many people believe that self-repair will not give them anything except for even bigger problems. Maybe these people have a lack of self-confidence. After all, you do not call a service each time you need to change a burned light bulb or hammer a nail. And using best dent pullers for car the process of a car repairing will take exactly the same amount of time. Manufacturers are not interested in selling complicated devices for everyday use because no one will buy them. Therefore, they try to make them as reliable and simple as possible so that both sides of the deal are satisfied. 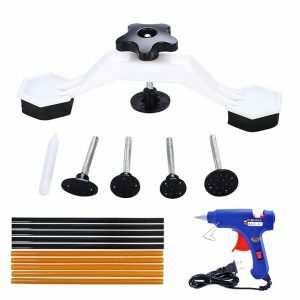 Visit our website, and you will see that we have a great variety of dent puller things that will help you to complete in-house car repair. 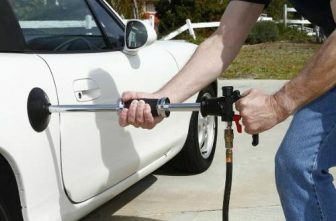 We have gathered the best dent pullers here in this article. Moreover, they cost very affordable (all represented items are under $20) so you can save time and money by buying this device.